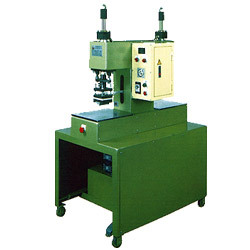 Yuan Yi Percise Machinery Works Co., Ltd. This machine is suitable for comprehensive material to make transfer-printing trademark, figure etc., such as footwares, leatherwear etc. 1. This machine is adopted front &rear control cabinet, one unit enable two set, great productivity, rapidity, cost saving. 2. This machine is adopted hyd action system, stable of pressure, smooth and not to effect by external factor. 3. This machine controlled by electronic constant temp and can be adjusted to ambient temp, the max. temp can be reached 200oC. 4. The transfer printing time, temp range & pressure etc., can be adjusted as requirement, beauty and accuracy of effect.